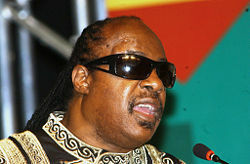 Stevie Wonder (born Stevland Hardaway Judkins on May 13, 1950, name later changed to Stevland Hardaway Morris) is a American singer-songwriter, multi-instrumentalist, and record producer. A prominent figure in popular music during the latter half of the twentieth century, Wonder has recorded more than 30 top-ten hits and won 26 Grammy Awards, a record for a solo artist. He also won an Academy Award for Best Song and has been inducted into both the Rock and Roll and Songwriters hall of fame. Blind from infancy, Wonder signed with Motown Records as a pre-adolescent and, after a period of estrangement in the 1970s, continues to perform and record for the label today. He had ten US number-one hits on the pop charts including "Fingertips (Pt. 2)," "I Just Called to Say I Loved You," and "You Are the Sunshine of My Life," as well as 20 R&B number-one hits, such as "Superstition" and "Living for the City." His albums have been hailed by critics as pioneering classics, with sales exceeding 150 million units. He is also noted for his musical sophistication, experimentation in the studio, and for helping significantly in the development of the synthesizer as an integral part of popular music. Wonder also writes and produces songs for many of his label-mates and outside artists as well. As an instrumentalist he was best known in his early career for his harmonica work, but today he is better known for his keyboard skills and vocal ability. Stevie Wonder was born on May 13, 1950 in Saginaw, Michigan, United States. He was a premature baby, and because the blood vessels at the back of his eyes had not yet reached the front, an aborted growth spurt caused his retinas to detach. He was thus blind from infancy. His family moved to Detroit when he was four. Stevie took up piano the same year and had mastered it by age nine. During his childhood, he was active in his church's choir. He also taught himself to play the harmonica and the drums, and had mastered both by age ten. 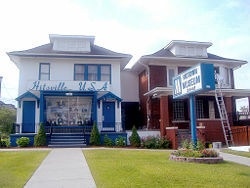 Hitsville USA, home of the Motown recording studios where Wonder worked in the 1960s. In 1961, at the age of 11, Stevie was introduced to Ronnie White of the popular Motown act The Miracles. White brought the boy and his mother to Motown Records. Impressed by the young musician, Motown CEO Berry Gordy signed Morris to Motown's Tamla label with the name "Little Stevie Wonder." He then recorded the minor hit "I Call It Pretty Music, But The Old People Call It The Blues." At 13, he had a major hit, "Fingertips (Pt. 2)," a 1963 single taken from a live recording of a Motor Town Revue performance, issued on the album, Recorded Live: The 12 Year Old Genius. The song, featuring Wonder on vocals, bongos, and harmonica, with a young Marvin Gaye on drums, was a number-one hit on the US pop and R&B charts and launched Wonder suddenly into the public awareness. Later dropping the "Little" from his moniker, Wonder went on to have a number of other successes during the mid-1960s, including the smash hit "Uptight (Everything's Alright)," as well as "With a Child's Heart," and "Blowin' in the Wind," a Bob Dylan cover which was one of the first songs to reflect Wonder's social consciousness. He also began to work in the Motown songwriting department, composing songs both for himself and his label-mates, including "Tears of a Clown," a number-one hit by Smokey Robinson & the Miracles. By 1970 Wonder had scored more major hits, including "I Was Made to Love Her" (1967), "For Once in My Life" (1968), "Shoo-Be-Do-Be-Do-Da-Day" (1968), "My Cherie Amour" (1969), "Yester-Me, Yester-You, Yesterday" (1969) and "Signed, Sealed, Delivered I'm Yours" (1970). On September 14, 1970, at the age of 20, Wonder married Syreeta Wright, a songwriter and former company secretary for Motown. Wonder and Wright divorced 18 months later, but they continued to collaborate on musical projects. Along with Marvin Gaye, Wonder was one of the few Motown stars to contest the label's factory-like operation methods: artists, songwriters, and producers were usually kept in specialized collectives, and artists had little creative control. When Gaye wrested creative control from Motown in order to release his innovative, socially conscious album What's Going On, Wonder was inspired to seek similar creative freedom from the label. Wonder argued with Motown owner Berry Gordy over creative control a number of times, and finally allowed his Motown contract to expire. He left the label on his twenty-first birthday in 1971. His final album before his departure was Where I'm Coming From, which Gordy had strongly opposed releasing. The album produced one top-10 hit, "If You Really Love Me." Wonder independently recorded two albums, which he used as a bargaining tool while negotiating with Motown. Eventually the label agreed to his demands for full creative control and the rights to his own songs, and Wonder returned to Motown in March 1972 with Music of My Mind, an album which is considered a classic of the era. This album also marked the beginning of a long collaboration with synthesizer pioneers Tonto's Expanding Head Band (Robert Margouleff and Malcolm Cecil). October 1972's Talking Book featured the number-one pop and R&B hit "Superstition," which is one of the most distinctive examples of the sound of Wonder's work the Hohner clavinet keyboard, sometimes mistaken for a harmonica. The song, originally intended for rock guitarist Jeff Beck, garnered Wonder an additional audience on rock radio stations. Wonder's audience was further broadened when he opened for The Rolling Stones on their much-heralded 1972 American Tour. In the meantime, his "You Are the Sunshine of My Life" went to number one on the pop charts and has been a staple love song in the decades since. His efforts for the year garnered him three Grammy Awards. The album Innervisions featured the driving "Higher Ground" (number four on the pop charts) was followed by the evocative "Living for the City" (number eight). Both songs reached number one on the R&B charts. The album generated three more Grammy Awards, including Album of the Year. Innervisions is ranked number 23 on Rolling Stone Magazine's 500 Greatest Albums of All Time. The album Fulfillingness' First Finale appeared in July 1974 and had two hits high on the pop charts: the number-one "You Haven't Done Nothin'" (a political protest aimed at Richard Nixon) and the Top-Ten "Boogie On Reggae Woman." Three more Grammys resulted, including one for Album of the Year. He also wrote the music and produced every song on the Syreeta Wright album Stevie Wonder Presents Syreeta. Wonder released what he intended as his "magnum opus," the double album-with-extra-EP Songs in the Key of Life, in September 1976. Sprawling in style and sometimes lyrically difficult to fathom, the album was hard for some listeners to assimilate, yet is regarded by many as Wonder's crowning achievement. It became the first album by an American artist to debut at number one on the Billboard charts, where it remained for 14 (non-consecutive) weeks. It generated two more number-one hits: "I Wish" and "Sir Duke." The celebratory "Isn't She Lovely," written about Wonder's newborn daughter Aisha, became a future fixture at weddings and bat mitzvahs fixture, while songs such as "Love's in Need of Love Today" reflected a far more pensive mood. Songs in the Key of Life won Album of the Year and two additional Grammys. The album ranks 56 on The Rolling Stone Magazine's 500 Greatest Albums of All Time. After this amazingly successful run, Wonder stopped recording for three years, releasing only the 3 LP Looking Back, an anthology of his first Motown period. 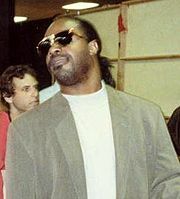 Stevie Wonder at a rehearsal for the Grammy Awards in 1990. In Wonder's next phase he began to reap the commercial rewards of his efforts though soundtracks and collaborative efforts. The 1980s saw Wonder scoring some of his biggest hits and reaching an unprecedented level of fame, evidenced by increased album sales, charity participation, high-profile collaborations, and television appearances. This period had a muted beginning, however, as Wonder returned to recording with the soundtrack album Journey through the Secret Life of Plants (1979). Mostly instrumental, the album was panned at the time of its release, but of late has come to be highly regarded by some critics. Wonder also wrote and produced the dance hit "Let's Get Serious," for Jermaine Jackson and, ranked by Billboard as the number-one R&B single of 1980. Hotter than July (1980) was a major success, with its single "Happy Birthday" acting as an effective vehicle for Wonder's campaign to establish Dr. Martin Luther King's birthday as a national holiday. The album also included his tribute to Bob Marley, "Master Blaster (Jammin')," as well as "All I Do," and the sentimental ballad, "Lately." In 1982, Wonder released a retrospective of his 1970s' work with Stevie Wonder's Original Musiquarium, which featured four new songs, including the ten-minute funk classic "Do I Do," which included legendary jazz trumpeter Dizzy Gillespie, and "That Girl," one of the year's biggest R&B singles. Wonder also gained a number-one hit that year in collaboration with Paul McCartney in their paean to racial harmony, "Ebony and Ivory." In 1983, Wonder performed the song "Stay Gold," the theme to Francis Ford Coppola's film adaptation of S.E. Hinton's novel The Outsiders. Often mistakenly attributed solely to Stevie Wonder, the music is by Carmine Coppola, while Wonder wrote the lyrics. In 1984 Wonder released the soundtrack album for The Woman in Red. The lead single, "I Just Called to Say I Love You," was another number-one pop and R&B hit. It went on to win an Academy Award for Best Song in 1985. That year Wonder was in a featured duet with Bruce Springsteen on the all-star charity single for African famine relief, "We Are the World." He was also part of another charity single the following year, the AIDS-targeted "That's What Friends Are For." His album In Square Circle featured the number-one pop hit "Part-Time Lover." In 1987, Wonder appeared on Michael Jackson's Bad album on the duet "Just Good Friends." After 1987's Characters LP, Wonder continued to release new material, but at a considerably slower pace. In 1991, he recorded a soundtrack album for Spike Lee's film Jungle Fever in 1991. In 1996, his Songs in the Key of Life was selected as a documentary subject for the Classic Albums documentary series. He also collaborated with Babyface for an emotionally charged song about spousal abuse (domestic violence) called "How Come, How Long." That year, he also performed John Lennon's song "Imagine" in the closing ceremony of the Olympic Games, held in Atlanta. In 1999, Wonder was featured on harmonica in the Sting hit "Brand New Day." In 2000, he contributed two new songs to the soundtrack for Spike Lee's satire Bamboozled: "Misrepresented People" and "Some Years Ago." In 2001, he worked with Damian Marley and Stephen Marley, sons of Bob Marley. In March 2002, he performed at the opening ceremonies of the 2002 Winter Paralympics in Salt Lake City. On July 2, 2005, he performed in the U.S. part of the "Live 8" series of concerts in Philadelphia. Wonder's first new album in ten years, A Time to Love, was released on October 18, 2005. He performed at the pre-game show for Super Bowl XL in Detroit in early 2006, singing various hit singles (with his four-year-old son on drums) and accompanying Aretha Franklin during "The Star Spangled Banner." In March 2006, Wonder received new national exposure on the top-rated American Idol television program. Each of 12 contestants were required to sing one of his songs, after having met and received guidance from him. That year, he sang a duet with Andrea Bocelli in his album Amore with harmonica and additional vocals on "Canzoni Stonate." Wonder also performed at Washington, D.C.'s 2006 "A Capitol Fourth" celebration, which was hosted by actor Jason Alexander. On August 2, 2007, Wonder announced the "A Wonder Summer's Night" 13-concert tour —his first U.S. tour in over ten years. New projects for Wonder include: a new album entitled The Gospel Inspired By Lula which will deal with the various spiritual and cultural crises facing the world; and Through The Eyes Of Wonder, an album which Wonder has described as a performance piece that will reflect his experience as a blind man. On September 8, 2008, Wonder started the European leg of his "Wonder Summer's Night Tour," the first time he toured Europe in over a decade. Wonder's songs are renowned for being difficult to sing and helped raise the bar for the complexity of the vocalization of lyrics. He is also noted for his highly developed sense of harmony and using many extended chords, such as ninths, 11ths, and 13ths in his compositions. His melodies often make abrupt, unpredictable changes and include melismatic vocalizations, meaning that a syllable is sung over several notes. Many of Wonder's songs are written in keys more often found in jazz than in pop and rock. For example, "Superstition" and "Higher Ground" are in the key of E-flat minor and feature distinctive riffs in the pentatonic scale, i.e. largely on the black notes of the keyboard. The albums Wonder released during his classic period (1972-1976) were highly influential on the music world. Rolling Stone's 2003 list of the 500 Greatest Albums of All Time included four of these albums in its list with three in the top 90. His ability to combine complexity with soul push popular music to new levels of sophistication. At the same time, his experimentation in the studio helped increase the recording industry's standards of production. Wonder played a large role in bringing synthesizers to the forefront of popular music. With the help of Robert Margouleff and Malcolm Cecil, he developed many new textures and sounds never heard before. It was also Wonder's urging that led Raymond Kurzweil to create the first electronic synthesizers that realistically reproduced the sounds of orchestral instruments. Thirty-four of Stevie Wonder's singles, listed below, reached the Top Ten on Billboard's Hot 100 chart in the United States, or in the United Kingdom. 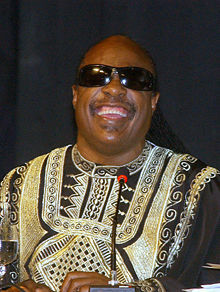 Twelve of Stevie Wonder's albums, listed below, reached the Top Ten in either the United States or the United Kingdom. This page was last modified on 3 August 2013, at 21:45.